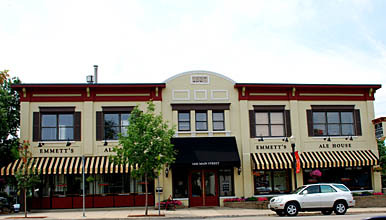 Opened in 2004 in the heart of Downers Grove, EMMETT’S ALE HOUSE offered some of the same brews as the original Emmett’s Tavern & Brewing located 30 miles northwest in West Dundee, Illinois, July ‘05. This high scale establishment featured American cuisine, spacious dining areas, and a central laminated formica wood bar with two televisions. A big screen TV in the back bar area keeps patrons entertained while a separate family-style dining area to the left proposed quieter environs. Glass enclosed brew tanks at frontage serve off-dry wheat-husked Munich Light Helles Lager, lively banana-sweet clove-backed Hefeweizen, and spicy yellow-fruited frisky-hopped serenity Dortmunder Export. Experienced drinkers will enjoy medicinal rye-caramelized whiskey-fruited 1 A.M. Ale and leisurely dry-hopped, wood-burnt, coffee bean-roasted Dry Irish Stout, two of brewer Rob Hunter’s finest prizes. Better still, sharp-fruited pine nut-influenced Victory Pale Ale and piney wood-smoked tangerine-berry-grapefruit-lacquered Centennial Amber Ale will please mainstream customers as well as seasoned connoisseurs.